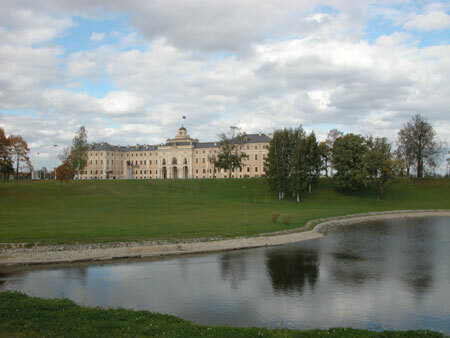 I am sure you've guessed by now that this and later albums present the recently built complex at Strelna, officially known as the State Palace of Congresses. 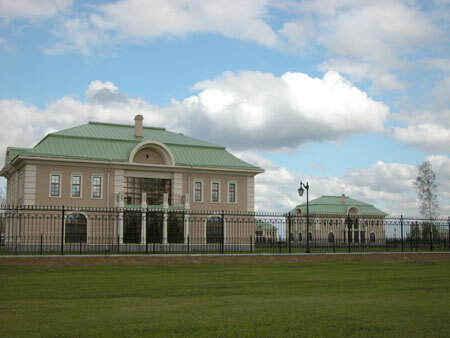 It consists of the restored and reconstructed Constantine Palace, its surrounding garden (newly laid out), and the visitor and service buildings, most newly built or moved. 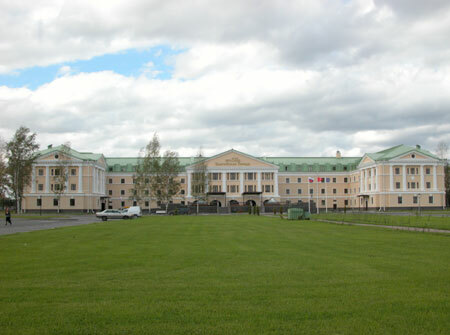 The whole complex is operated by the Presidential Administration (the main customer of reconstruction contracts). However it is easy to see the place as part of an all-too-brief, groups-only tour (more details in the next album). 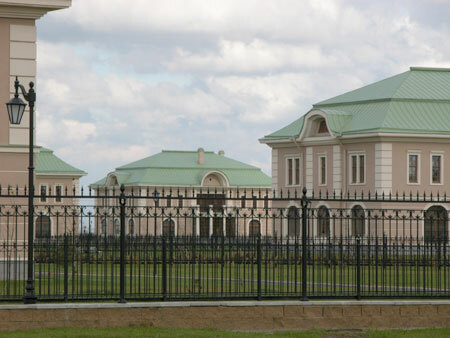 As you drive west from Saint-Petersburg along the Peterhoff highway, you soon come up on the Constantine Palace on your right. This used to be called the Upper Garden; the pond to the right - the Grand Palace pond. The names have, probably, been kept still. 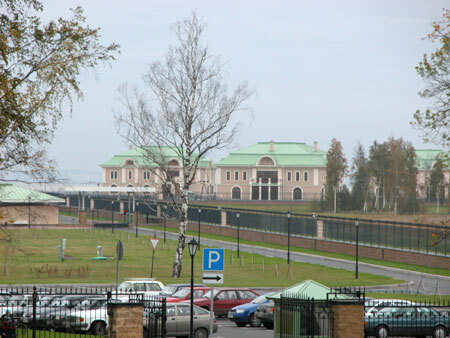 A high fence surrounds the complex (the photo above was taken through the railings). The whole complex is very seriously guarded. In the 19th century there was a wooden fence here. 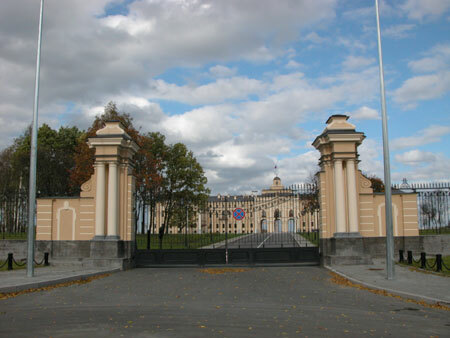 The new gates are on the left. I don't know if there were gates here before, but I don't think so. 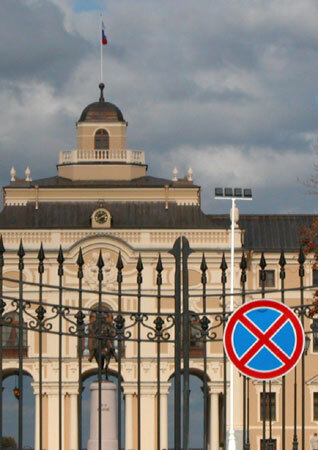 Even though the gates are not centered vis-а-vis the Palace, this is almost unnoticeable in this photo (taken through the railings of the gates). But I am getting ahead of myself with all these views through the fence. I really wanted to start with what is new in the vicinity of the complex and devote later albums to the Palace and its surrounding park. 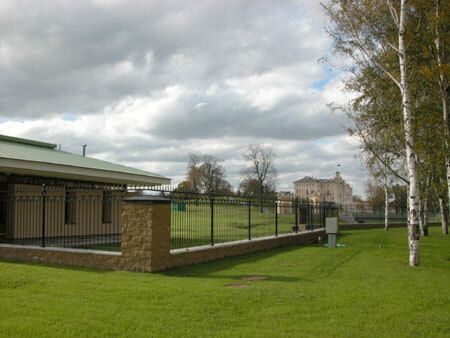 This photo shows part of the security road block at the gates through which all tours enter the park. In the distance you can see the Palace. We won't go there now, but will pass it and take a right turn. The overall size of the work undertaken here is impressive. It seems the project was done with sense of grandeur. I had driven past the place during the reconstruction and can attest that there wasn't even much grass here - just bulldozers and excavators. 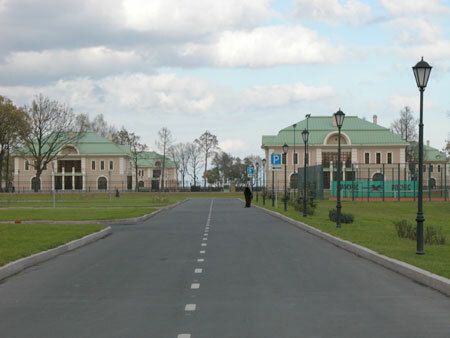 The reconstruction ran day and night from about November 2001 to May 2003. 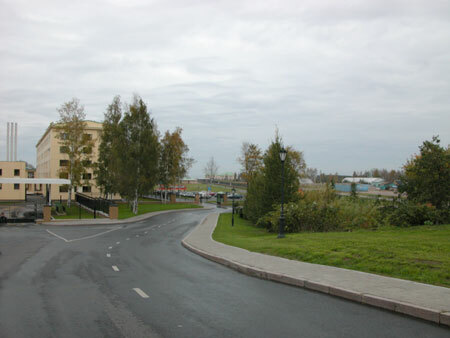 In parallel with the project, the section of the Peterhoff highway up to Strelna was widened (the traffic is almost never congested past that point). Along the highway some attempts were made to gentrify some areas. Now all that surrounds the complex - the roads, the light posts, the grass and the bushes, and the car park - are neatly kept up. This street is called the Birch Alley. A bit farther ahead is the hotel complex Consular Village, behind its very own separate fence (a few months ago there was a forest here). Here is the overall view. 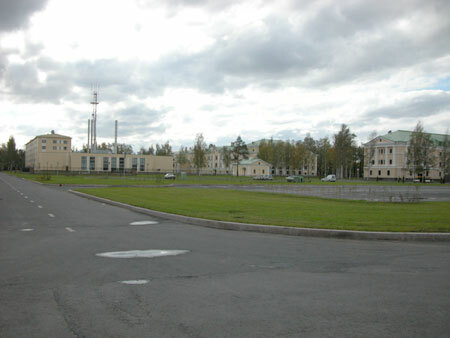 We are walking from the left corner where the Peterhoff highway runs. Behind us is the Gulf of Finland. 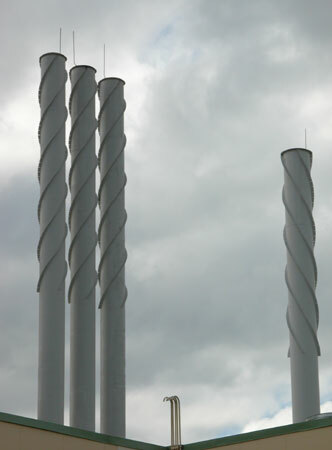 ... as noted by a reader, the welded spirals are there mostly to reduce vibration due to wind - the "ribs" interfere with air flow and increase vibration frequency above resonance level. And it looks more interesting this way. Here is the aforementioned hotel - the Baltic Star. I have often read that it was built in 2003. That is not the case. 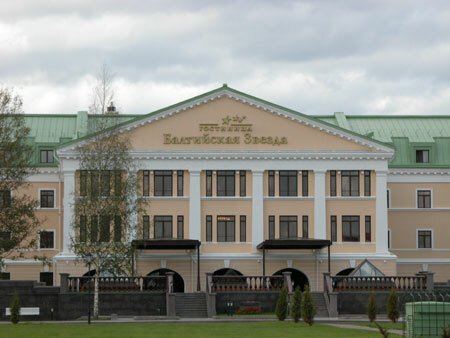 This building used to belong to the Leningrad Arctic College, and has now been remodeled in to a hotel (at the minimum the mansards were added and the insides completely redone). As to when the building was put up originally - I don't know. This is not presidential or even oligarch level, of course. Still, I was able to count four different size stars above the name. We are now getting closer to the cottages. They are called VIP-class Cottages. There are 19 of them. 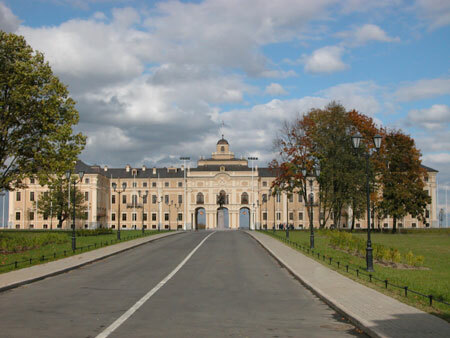 Despite the high quality and high class of the cottages, the photo reminds one of an exemplary correctional facility. You can judge for yourselves - a hive of identical buildings, each encircled with a high fence. Not a tree, a pond, or a landscape in view. Nothing but unobstructed lines-of-sight all around. 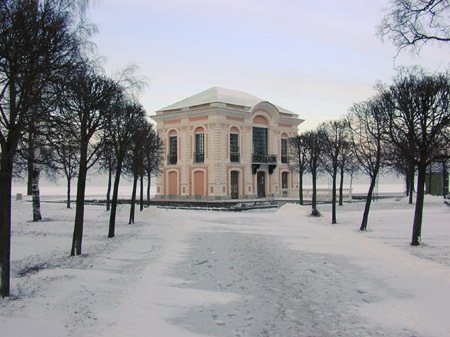 The outside of the buildings recalls both the Marli palace and the Hermitage pavilion at the nearby Peterhoff. 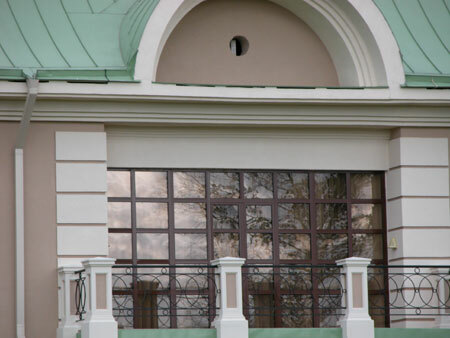 Here is a close-up of a cottage balcony. 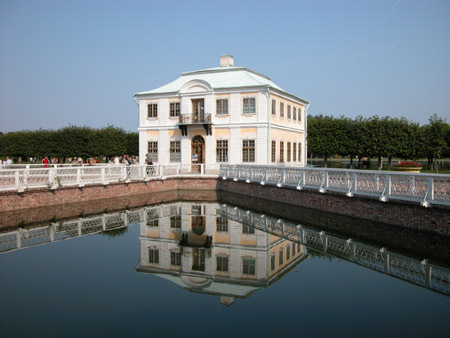 I should point out that the restoration of the Palace, with all these newly built hotels, is further exacerbating the problem of the overbuilding of the shores of the Gulf of Finland with all manner of cottages for the businessmen and the government types. 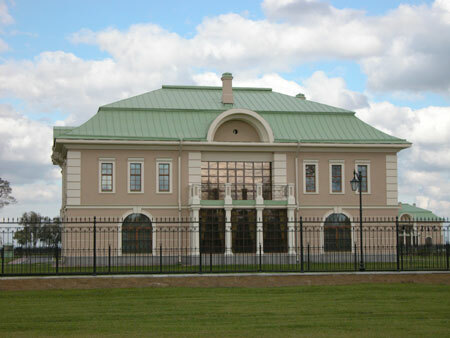 It is considered now prestigious to reside not only near Peterhoff, but also "that much closer to the tsar". 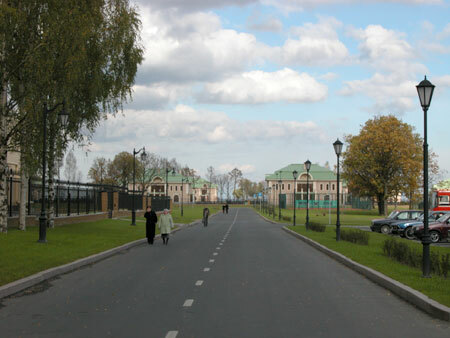 In a following album we will enter the park and move toward the Palace.